The book attempts to teach/explain certain qualities/emotions that children start feeling at their tender age but don't know what it is and how to handle it and even what exactly it is they are feeling, like Envy, Pride, Greed. And, it also attempts to teach certain desirable qualities like Respect, Contentment, Loyalty, Compassion, Modesty, Open-mindedness, Fairness, Politeness etc. 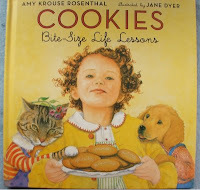 And, the book does all of this with short crisp sentences and illustrations that are all cookie-based! Fair means, you get a bite, I get a bite; you get a big bite, I get a big bite. Unfair means, you get a bite and I get the rest of the cookie. Open-minded means, I haven't seen cookies like these before, but, uh, sure I'll try one. Polite means, can you please pass the cookies? Thank you! The illustrations show a little girl about Ana's age, with similar curly brown hair, which completely captured Ana's attention. The book places the little girl and her friends be it humans or animals, in various situations that bring out the direct meaning of the words, in context. This idea of using situational experience, using cookies, to teach words and emotions seems quite clever yet straightforward. More importantly, I got a good way of expanding her vocabulary so that nowadays, when she demands, "give me some apple juice, Amma", all I have to say is, "How do you ask politely, Ana?" and she immediately rephrases, "Amma, I'd like some apple juice, please." Similarly, when she refuses to take a bite of some meal I have made for her, I remind her, "Open-minded means...??" and she says, "OK, I'll try a bite". Now, I am not claiming she fully understands the nuances and shades of meaning and associated depth of emotion for each of these words, but, it is a start. It helps me expand on it further and explore her feelings when needed. She instantly loved it and is always very interested and attentive when I read it to her. The simple and clever sentences make it easy to teach her new vocabulary and help describe complicated emotions in ways that even a three-year-old can begin to understand. The text is in cursive, so, am not sure how easy it would be for beginner readers to read alone. This seems to be a lovely and very interesting book, trying to teach children through something which they all love and relate to ! Thanks for another lovely pick by a lovely author!